The Auferstehungskirche / Church of the Resurrection in Essen-Huttrop was built by the famed architect and church builder Otto Bartning in 1929. Historically, Bartning followed older ideas about shape and function of circular churches used for baptizing and funeral services. During World War II the building suffered severe damage, and was repaired during the subsequent decades. 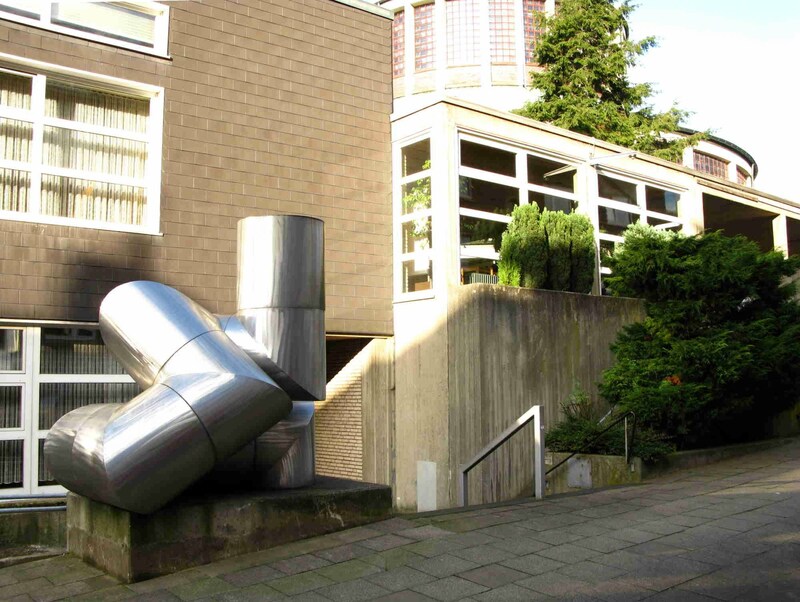 In 1974 the Essen architect Wolfgang Schwartz was commissioned with such project, the scope of which included plans for a contemporary sculpture to be set in the narrow space by the road between church and parish hall. - Conceptual design and execution were consigned to me. It is a challenge to design a sculpture appropriate for a space along a sloping road which, at its top, is crowned by an epic building, with this sculpture to integrate - through its material, shape, and function - into the existing space, and at the same time for the sculpture to contribute something of its own to the space between church and parish hall. In addition to an artist´s distinctive mark this requires an orientation within the wider context. And this leads to detailled studies on matter and construction, i. e. of material as as means for expression. Use of semi-finished products out of industrial fabrication for post-modern construction work has - from the beginning of my professional activity - made me coin the term "functional sculpture" in order to successfully apply the numerous interdependencies between art and technology to the concept of art in public space. I have therefore responded to the concealed steel skeleton of the church building with tubular elements of shining stainless steel. An interrelationship between circular and upward gyrating movement developed: thus the sculpture has become the connecting form between the parish hall below, and the circular church rising above it. The location was set with a concrete pedestal, - right in the centre between upward and downward stairs and the connecting ways between church and parish hall. The sculpture has thus become a mark providing both direction and meaning. Out of the horizontal plane modules and volumes rise in circles and gyrations to finally, with the last element, reach skyward. 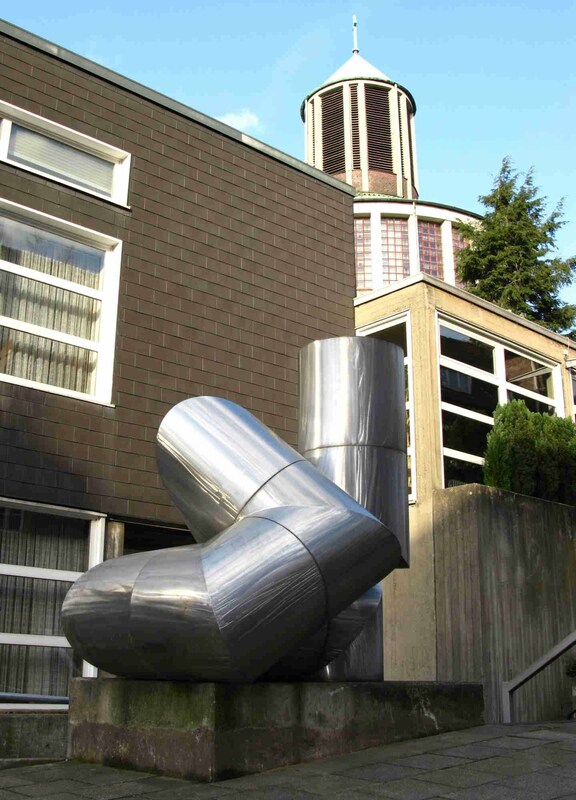 The sculpture integrates into the parish: first with its external course of movement, which resembles the central part of the church. - In addition, it propaedeutically points from the exterior of the church to its interior: below the highest point of the room, the lunette, rises the baptistery, surrounded by numerous Christian symbols. Baptism and resurrection conclude the circle of theological sense. Architecture and sculpture are the media which allow this message to be read. Note: the Auferstehungskirche / Church of the Resurrection is actually located in the city district of Essen-Südostviertel (not -Huttrop). The two districts border on each other and are often mixed up.